"I would suggest that this is an eraly Illinois, Model 3, fifth pinion, lever set, 17 Jewel with coarse train, manfactured in 1880." I just recently purchase a lot of 6 watches off of the wonderful auction site ebay, for $100 U.S. They are working save one. I shall post photos of them as soon as I receive my bounty. Ok I got the watch today, and I took some pic's for you guys (taken with phone). 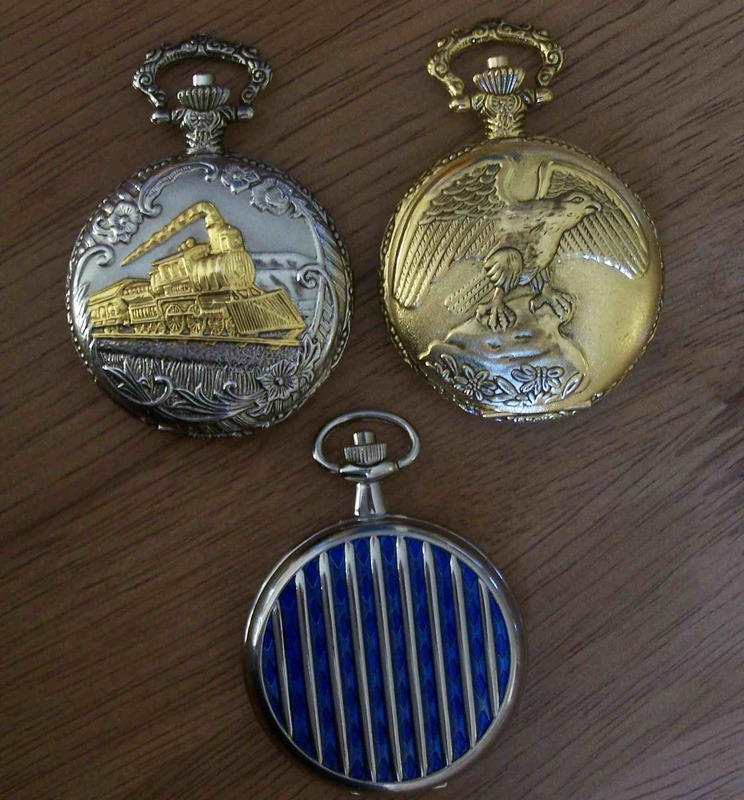 Ok a few of the watch and chain (was supplied with the watch) not sure what its made from. sorry for lots of pictures but I hope you enjoy! 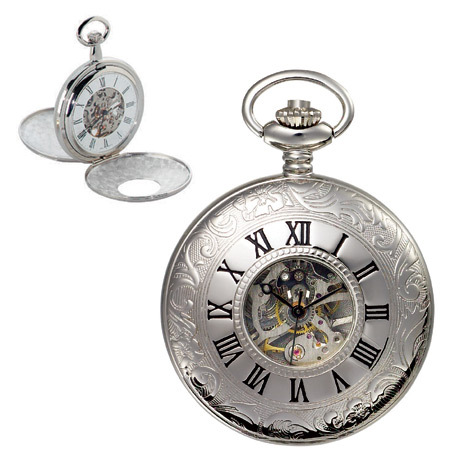 Be sure to lookin in on the National Association of Watch and Clock Collectors for all kinds of information on all things horological. Also, they have frequent marts where great stuff can be got at a reasonable price! The NAWCC is actually an international organization, and you might even find one in your locale. 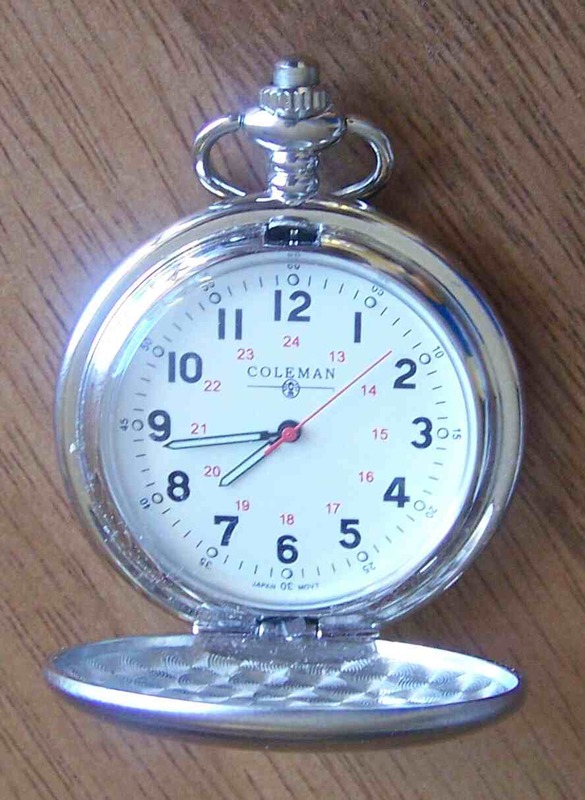 Every serious clock and watch collector I know knows about and is a member of the NAWCC! 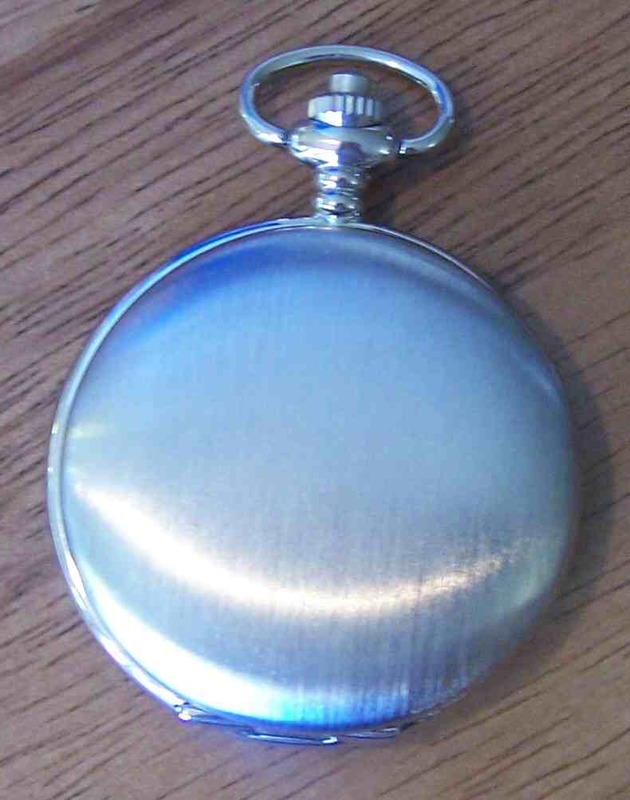 I've just taken an old (but fairly common) pocket watch that I bought on ebay (glass broken, face scratched slightly, gold plating worn on the back, and runs too quick) into a watch repairers (Butlers of Cheltenham UK) and to get a new glass (NOT plastic!) and the balance spring fixed it cost about £30! Well the watch only cost me £10 from ebay so I now have a worn but stunning watch that hasnt lost a second in the last 5 days! Well shoot. For that kind of price, I could have paid to send my Bourquin to your watchmaker. The guy I gave it to has had it for over a month, and when I called today, he said that it would still be next week before he was done with it. It had to have one of the jewels on the balance staff replaced, a new main spring, and general cleaning and servicing done, which is going to be about $165! *sigh* So that brings my total investment on this watch to $340. Not exactly what I was expecting. I just posted about my new watch here. Gorey's Alphabet runs through my mind at the MOST inappropriate times. as he sits at the edge of my bed. but for seventeen years he's been dead." Granted, that's probably not 100% accurate, but its close! Where you start doesn't determine how far you will go - the people who believe they can, and the people who believe they cannot, are both right. While shopping around for one of my own I spotted some very high quality watches of this nature over at The Gentleman's Emporium. For anyone who is also in the market for one I highly suggest it, these are all the ones that are available at the Emporium. "Madness is never to far away." 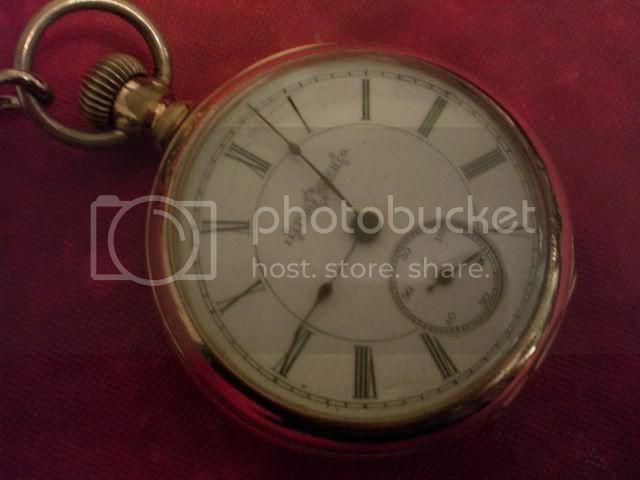 I have a question about my pocket watch. As far as I can tell the outer parts are made of silver plated brass. The letters A.A. on the back suggests that it belonged to my great grandfather who died 1946ish. This is what I want to know: What does Ancre ligne droite mean? Is that the manufacturer? 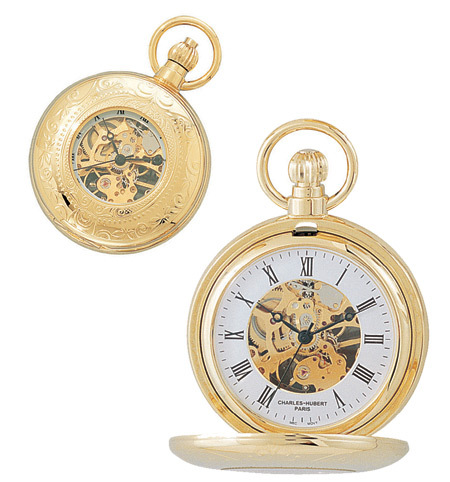 "The lever escapement was the invention of the Englishman, Thomas Mudge (1715-1794). In its current form, it is shown in Figure 4. The wheel comes to rest on an intermediate part called the lever. In French, it is called ancre (anchor) because it looks vaguely like a boat anchor." 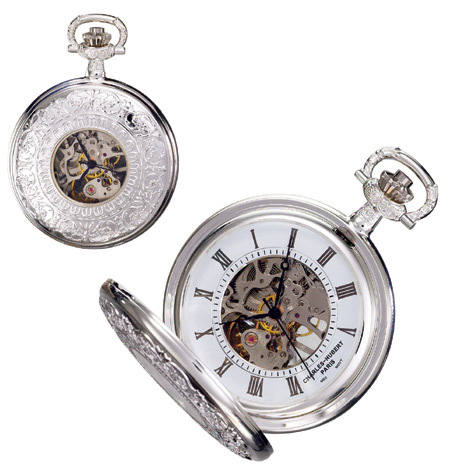 "Ligne droite" is sometimes found on the case of a watch where escape-wheel, pallets, and balance are in a straight line as, e.g., in the Swiss lever escapement. Contrary to this design, the escape-wheel is at right angles to a line between pallets and balance in the English lever escapement ("ligne rectangulaire"). I found a small imprint on the inside of the back cover and a similar one on a part of the movement (could be what wikipedia says is a bar. I don't even know what these parts are called in Swedish...). The imprint, or engraving or whatever reads GF or possibly CF and is framed by an oval shape. Could this be some sort of manufacturer's signature or similar? Then today I was at Wal-Mart looking for a shade structure when I decided to check the watch section. Lo and behold, they had 3 different models on sale for $8 each! I know they are cheap-o with a capital CHEAP, but they are so pretty, and my daughters are now hooked. The covers are noticeably thin and all of them feel lightweight, but maybe I can rip out the quartz Japanese movements and insert something steamier. 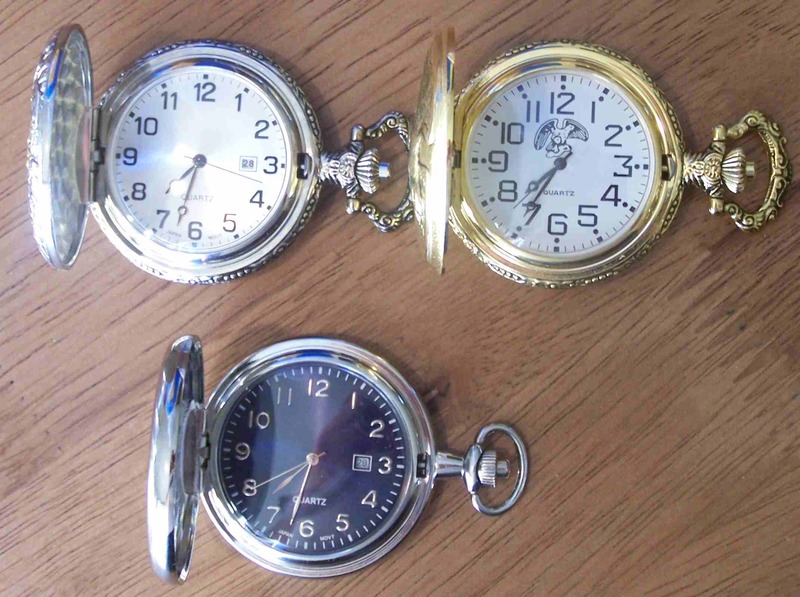 I look forward to replacing them soon with a nice quality mechanical watch. Don't anthropomorphize your steam automatons: They hate that. You never know what lonesome is , 'til you get to herdin' cows. Reluctant slave to the bean. Words have power. We have all experienced this in one form or another. Words also have the potential for selective power. What may be mundane scribbling to one person may be life-changing to another. Sir, what you have so nonchalantly suggested is, to the denzines of this humble forums, Big. Please, please go ahead and make this digest. We will await it with bated breath. "Don't forget to use a reasonable amount of caution should your hobby be one that is dangerous. Your wife doesnt want you to be 'funky' but she has a right to expect you not to take undue risk in your auto car, bicycle or flying machine." Really sir? Would you be so kind? Of course, i cannot speak for everyone, but I feel that would be wonderful! That would be great. 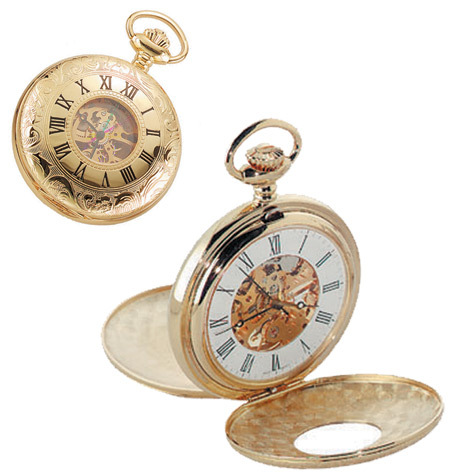 I have always had an interest in watches especially since I have my grandfathers pocketwatch. One man's (insert word) is another man's SteamPunk. Might take me a while, fair bit of typing/scanning to do. I'll post updates as they happen..
very very good, I am interesting too. Will you release the material with a free license or not? That would be invaluable! Please and thank you! What an excellent notion. Great shall be your reward in heaven. May contain nuts and bolts. Would you consider a Creative Commons license? "The fact that I wear the protective coloration of sedate citizenship is a ruse of the fox — I learned it long ago." Page created in 0.172 seconds with 17 queries.